What Chitika found was that 43 percent of the overall query volume coming from Google (mobile and PC) carried a local intent. That compared with 25 percent on Yahoo and Bing. Roughly two years ago Google reported that 20 percent of PC queries “were related to location.” Since that time Google has put considerable effort into its local and map results, both online and in mobile. In 2011 Google said that 40 percent of mobile search traffic is local. And last week a Google representative at an event informally said that now 50 percent of mobile search carries a local intent. Obviously mobile search has raised the overall local percentage reported by Chitika (see postscript below). But these figures argue that local search volumes across engines are now quite massive. Indeed, they represent billions of queries monthly on the PC and mobile web. In addition they’re very high-value queries because local searchers are more likely to covert than others, especially mobile users. 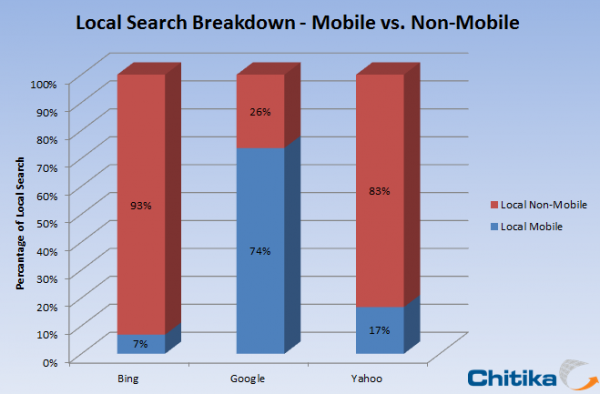 Postscript: I asked Chitika to provide a breakdown of PC vs. mobile search in these findings. Chitika said that nearly three-quarters of Google’s local queries are in fact coming from mobile. It’s the opposite for Bing and Yahoo. However this is logical given that their mobile query volumes are so small compared to their PC volumes and to Google’s mobile search volume. Postscript II: The numbers above are incorrect. Chitika contacted me today and said there was an error in their methodology. It resulted in an inflated Local and Local-Mobile total for Google. They’re providing revised/corrected figures and an explanation of what happened. I’ll do a new post exposing those shortly.